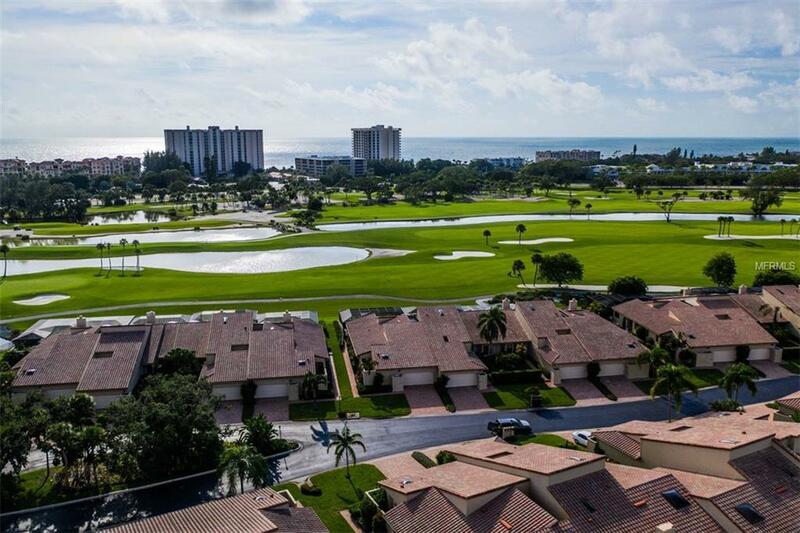 A rare opportunity awaits at this gorgeous maintenance free golf course home in the gated community of Bay Isles of Longboat Key! With 3 bedrooms and 3 full baths, the open floorplan of this coveted end unit villa is unique to the Harbour Circle community of 42 homes. All 3 bedrooms are en suite, and the views of the golf course include water features on the course, with beautiful birds and swans. The light and bright open plan has stunning hardwood floors, renovated kitchen and baths, vaulted ceilings with skylights and two atriums. The villa has a private caged pool and lanai where you can watch the sunset while taking in expansive views of the golf course and beyond. One of the most desirable locations on Longboat Key, this villa is part of the Bay Isles community with its beautiful marina, private beach club and meandering landscaped walkways. Bay Isles is next door to shopping, banking, and the Town of Longboat Key tennis, library, post office and town hall. Dont miss this opportunity to live a resort lifestyle just minutes from St. Armands Circle and downtown Sarasota. Pet Restrictions Maximum 2 Pets. Dogs Are Breed Restricted Per Rules And Regulations. Any Size And Weight Allowed.